Background: Associating liver partition and portal vein ligation for staged hepatectomy (ALPPS) is a novel surgical technique liver resection in traditionally nonresectable primary intrahepatic tumors or colorectal liver metastases. Materials and Methods: From June 2013 to March 2014, patients with primary tumor of liver or colorectal tumors with liver metastasis were selected to evaluate whether they met the initial criteria for ALPPS procedure. Results: Nine patients enrolled in the study with primary diagnoses of colon and rectosigmoid cancer, carcinoid tumor, gastrointestinal stromal tumor of small intestine, hepatocellular carcinoma, and pancreatic neuroendocrine tumor (PNET). Four candidates excluded from the study prior or during the first step operation due to fatty liver, hepatic fibrosis, peritoneal seeding, and multiple small intestine metastases. Five patients underwent two stages of ALPPS with the interval of about 1 week. Liver hypertrophy was 100% among our candidates after the initial step. One postoperative death happened because of massive pulmonary thromboembolism Recurrence of liver metastasis was seen in one patient. Hepatic failure Class B and A were observed in two patients which did not progress during follow-up period. One patient developed an enterocutaneous fistula. Discussion: We recommend to use 2 organ bags, one for wrapping right lobe and the other one for covering visceral organs and also do liver biopsy in suspicious cases of damaged liver parenchyma and laparoscopic exploration of abdomen for seeding and multiple metastases prior to laparotomy. Conclusion: As the procedure has not been well established and verified by oncologists yet, further studies are required to define the exact indications of ALPPS. Liver metastases are being diagnosed at earlier stages because of high-quality imaging techniques and regular follow-ups. Among colorectal cancer cases, liver is the common site of metastasis. Colorectal liver metastasis (CLM) is diagnosed in 20% of cases simultaneously with initial cancer because of their asymptomatic nature and transient symptoms. Extended liver resection in primary intrahepatic tumors or CLM is an inevitable surgical approach for the affected patients., Associating liver partition and portal vein ligation for staged hepatectomy (ALPPS) has been evolved recently as a salvage therapy for traditionally non-resectable liver tumors. It has opened a window to the patients with right hepatic lobe tumor with insufficient future liver remnant (FLR). Rapid and extensive regeneration of hepatic tissue provided by ALLPS could decrease mortality of patients due to tumor progression. But after being introduced by Schlitt et al. in 2010, ALPPS was applied widespread regardless of its indication among hepatobiliary surgeons and lead to high morbidity and mortality.,,,, In some cases with damaged hepatic parenchyma although required regeneration of hepatic tissue occured but the hypertrophied tissue did not show satisfactory function. Further clinical investigation is crucial to define precise indications and also find out whether the patients benefit from the ALPPS procedure despite high cost of mortality and complications. Till now, limited available experiments have been conducted on technical feasibility, reliability, and safety of the ALPPS procedure. This article presents the method in details with precautions need to take, candidates for ALPPS, their postoperative complications and outcome during near3 years follow up. During June 2013 to March 2014, nine patients were scheduled to undergo ALPPS procedure. Patients enrolled in our study were all candidates for hepatectomy because of primary or metastatic liver tumors. Expected FLR to total liver volume ratio for ALPPS is considered to be 20%–30% in normal hepatic tissue and 40% to 45% in patients with an underlying liver disease. ALPPS procedure proceeded to the 2nd step in patients who achieved adequate hypertrophy in 7–9 days after the initial step. Patients were followed every 3 months by ultrasound and every 6 months by computed tomography (CT) scan. In colorectal cancer with liver metastasis, carcinoembryonic antigen level was checked every 3 months. Written consent forms were obtained from all patients. ALPPS procedure is performed in two stages. A reverse L laparotomy incision is applied based on the location of the primary tumor, abdomen's anatomy, and resection site. First, the abdominal cavity is explored through a midline incision 2 cm above the umbilicus. Then, the incision is extended to the right horizontally if it is not contraindicated (e.g., multiple small hepatic metastases or peritoneal seeding which was not obvious on CT imaging). If the primary tumor is located in sigmoid or rectosigmoid junction, the incision goes 2–4 cm below umbilicus [Figure 1]. The liver is mobilized by dissecting the ligaments thoroughly from left and right. Hilar lymph nodes were dissected subsequently. After identification of the right, left, and middle hepatic arteries, the right hepatic artery is encircled by a vessel loop. Then, cholecystectomy is performed as usual, and the cystic duct is saved for further checking of bile leakage. By reaching hilar plate after common bile duct identification, portal vein is dissected distally up to the bifurcation. While branches are exposed enough, right branch is marked by vessel loop. 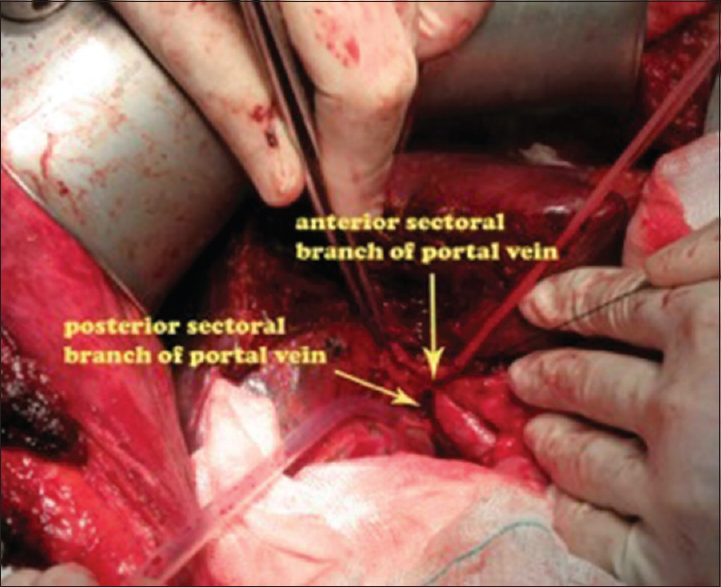 It is necessary to pay attention to anatomical variation of portal vein. For instance, patient D had separate perfusion pathways for anterior and posterior sectors [Figure 2]. Missing such anatomical variations of portal vein may lead to insufficient FLR hypertrophy. Liver is further mobilized to be detached from caval vein. Based on the tumor location, the partition line is defined by electrocautery. In situsplitting is performed by CUSA and Ligasure device using hanging maneuver. We do not use Pringle maneuver routinely to reduce FLR injury due to ischemia. Partitioning of the superior part of the liver is done 1 cm distal to hilum. To prevent probable portal triad injury, caudate splitting is postponed to the second step of the procedure. After checking biliary leakage, the right lobe, containing lesions, is wrapped in a sterile organ bag. Normally, these organ bags are used in transporting the transplant organs. Although deserosations had been repaired in patient D, adhesions developed between the incision site and small intestine and caused enterocutaneous fistula. Since then, exposed surface of visceral organs has been covered by another organ bag to prevent developing adhesion bands and facilitate the 2nd step of laparotomy [Figure 1]. Using organ bags provide greater exposure and better handling, because the loops of intestine bind together. At the end of the first step, a Jackson-pratt drain is placed near liver and fascia is sutured. Then, the patient is admitted to Intensive Care Unit, and antibiotics covering Gram-positive and negative microorganisms are administered. In the 6th postoperative day, FLR hypertrophy is assessed by multiple detector CT scan which has been demonstrated in literature., If FLR hypertrophy is adequate, the patient will undergo the second step on the 7th postoperative day. If not, it will be postponed to 3 days later, again after imaging evaluation. During the second step of the procedure, the right hepatic artery is identified and marked by a vascular clamp. Later on, it is preferred to ligate the artery at anterior and posterior sectors to make sufficient perfusion to the biliary tract. While there is not enough space to rotate liver to the right due to the left lobe hypertrophy, it is recommended to extend the incision transversely to the right and cut the rectus muscle. Dissection at hilum plate is continued, till arterial branches of anterior and posterior sectors are identified and ligated. Moreover, it is followed by excision of caudate lobe and removal of the sample. Biliary ducts of the sectors are identified and sutured by polydioxanone (PDS; Ethicon 6-0), while biliary leakage is checked by injection into the preserved cystic duct. If the primary tumor of colon has not been resected previously, colectomy is performed in this stage. Finally, a Jackson-pratt drain is placed and fascia is repaired. The incision is sutured through tertiary wound management. Demographic and operative data of the ALPPS candidates are demonstrated in [Table 1] and [Table 2]. Regarding outcome and follow-up, patient B, was a bronchial carcinoid tumor case treated with lobectomy surgery 6 years ago but he came back with presentation of carcinoid syndrome, again few years after. CT imaging showed a lesion in liver and biopsy revealed neuroendocrine tumor. He underwent ALPPS procedure with no postopertaive complication. Patient C died because of massive pulmonary thromboembolism (PTE) 3 days after the second step. Patient D suffered from intestinal fistula leading to sepsis and Child class B hepatic failure 7 days after the first step of operation. Furthermore, right-sided pleural effusion developed and was treated by inserting a chest tube. After 45 days of hospitalization, patient D has made a satisfactory recovery from enterocutaneous fistula and discharged with total bilirubin amount of 5 mg/dl. Patient E developed hepatic failure Child class A and right-sided pleural effusion which was drained. No evidence of recurrence and/or metastasis was detected in the follow-up visits of these two patients. In patient B, the CT after 1 year showed a 2 cm lesion at the cut surface of the liver. However, liver biopsy from segment III did not represent any tumor recurrence. Further imagings showed no alteration in the size of the mass till now. Patient A was referred again with few metastatic focuses in segments II and III after 11 months and underwent multiple radiofrequency ablations and chemotherapy. He is still alive and no hepatic failure is established yet. It has been observed 25% recurrence rate among our patients during the follow-up period [Table 1]. Four candidates of ALPPS with diagnosis of pancreatic neuroendocrine tumor (PNET), colon adenocarcinoma, PNET with unknown origin and rectosigmoid tumor had their surgeries canceled intraoperatively [Table 2]. In two cases (G and I), fatty firm liver have been detected during primary abdominal exploration. Frozen section demonstrated 40%–50% steatosis and fibrosis in these cases. 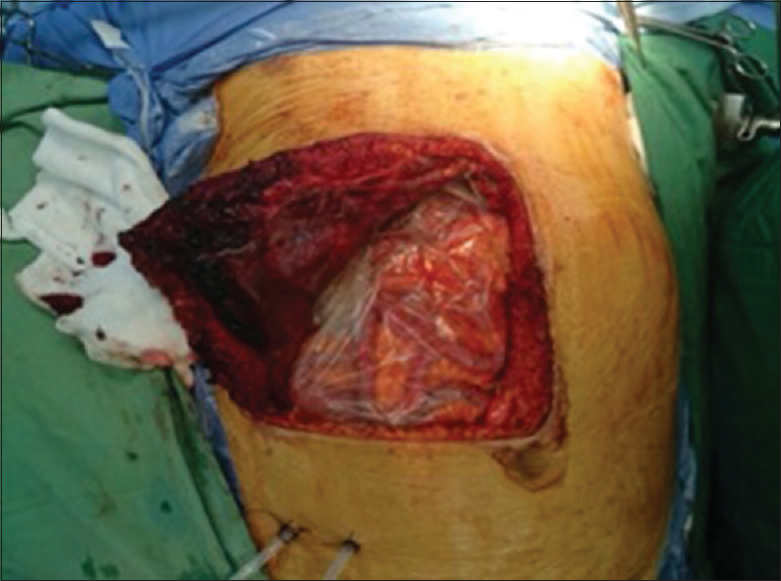 Since hypertrophy of about 2–3-fold is mandatory and damaged hepatic tissue is unable to produce the required volume, hepatectomy was canceled to prevent postoperative hepatic failure. Resection of the primary tumor was performed in case I who was affected with CLM to relieve partial obstruction symptoms. Peritoneal seeding and several small metastases were observed during primary exploration in cases F and H, respectively [Table 2]. This study consists of all the candidates of ALPPS procedure, either patients for whom operation was done successfully or patients who met the criteria for ALPPS in initial assessment but failed to complete the procedure due to some reasons. Although there is no oncologic verification of ALPPS, we only used this method in patients for whom there was no alternative treatment. [Figure 3]. In order to avoid unnecessary laparotomies, we paid utmost attention to patient selection. However many authors emphasized on necessity of having a common criteria, it is not determined yet. Early experiences of ALPPS reported postoperative complications which may be due to misusing the technique extensively. Then, some restrictions on patient selection were applied in response to high morbidity and mortality including age limitation to under 70, and  exclusion of patients with hilar cholangiocarcinomas, or severe portal hypertension. Previous studies indicated that most of the patients underwent the first step of procedure would complete the second step as well, considering sufficient FLR hypertrophy between two steps., In our study, sufficient hypertrophy was developed after the first step in all patients indicating 100% feasibility. As mentioned above, one of the limiting factors of this method is high morbidity of about 43%–60% due to hepatic failure, bile leakage, and perioperative infections., Despite one postoperative death because of massive PTE, hepatic failure rate among our patients was similar to other reports. Unlike other studies, bile fistula and leakage were not found among any of our patients. According to Kawarda's classification, bile duct of segment IV drains the left hepatic area near the confluence in 35% of cases. Based on this fact bile leakage is due to missed open end of the segment IV A/B ductules which is injured or cut during liver partitioning. Hence, if the transect line is not alongside the falciform ligament, reviewing the biliary tree anatomy of this segment is advised. This approach prevents closure of the biliary duct and postoperative cholangitis or bile leakage. Some evidences recorded postoperative hepatic failure in spite of extensive FLR hypertrophy. As a matter of fact, regenerated hepatic tissue does not have function in proportion to the volume. To mention one reason, chemotherapy or underlying disease may cause malfunction of liver parenchyma.,,, To proceed to the next step, FLR of 20%–30% is acceptable in normal hepatic tissue and the FLR of 40%–50% in damaged hepatic tissue such as chemotherapy-treated parenchyma.,, Steatosis and fibrosis was seen in 2 of our cases who had diabetes and hypertension and were pretreated by chemotherapy. Since damaged hepatic tissue is unable to produce the required volume, hepatectomy was canceled to prevent postoperative hepatic failure. Therefore, we suggest taking liver biopsies in suspected cases of fatty liver due to an underlying disease and patients underwent chemotherapy. Patient selection will be more precise while mandatory amount of FLR hypertrophy is evaluated by liver biopsy. In two scheduled cases, the operation was not performed because of small peritoneal seeding and multiple small liver metastases. Regarding these cases, although no contraindication for ALPPS exists before surgery, intraoperative findings caused cancellation of hepatectomy. Therefore, diagnostic laparoscopy before the main surgery is recommended for better patient selection. The development of inflammatory adhesions following the first step makes the second step more challenging. Here we mentioned a patient with the complication of intestinal fistula after the second step of procedure. He developed adhesion bands from intestinal loops to the anterior abdomen wall. We advised to cover the cut surface of liver and the visceral organs with an extra organ bag to prevent visceral contact with the incision site. One of the difficulties is that the intestinal loops attach together and could not fill the empty cavity generated after hepatectomy. The solution to this problem is releasing omentum from stomach and transverse colon and placing it below the right diaphragm. Furthermore, this maneuver may seem to seal bile leakage as well. Importantly, the surgical incision type has to be considered, especially among CLM cases. Based on our experience, reverse L incision gives access to much wider area. In metastatic lesions, it is preferred to have a midline incision and decide on where to put the transverse incision according to the primary tumor location. ALPPS seems to obtain a role in liver metastases surgeries. Selecting candidates for ALPPS is still a challenging aspect of this procedure. We used reverse L incision and an extra organ bag for our candidates. Furthermore, diagnostic laparoscopy and biopsy before main surgery is suggested. However, further clinical studies are necessary to improve ALPPS procedure. Truant S, Scatton O, Dokmak S, Regimbeau JM, Lucidi V, Laurent A, et al. Associating liver partition and portal vein ligation for staged hepatectomy (ALPPS): Impact of the inter-stages course on morbi-mortality and implications for management. Eur J Surg Oncol 2015;41:674-82. Schadde E, Ardiles V, Slankamenac K, Tschuor C, Sergeant G, Amacker N, et al. ALPPS offers a better chance of complete resection in patients with primarily unresectable liver tumors compared with conventional-staged hepatectomies: Results of a multicenter analysis. World J Surg 2014;38:1510-9. Schnitzbauer AA, Lang SA, Goessmann H, Nadalin S, Baumgart J, Farkas SA, et al. Right portal vein ligation combined with in situ splitting induces rapid left lateral liver lobe hypertrophy enabling 2-staged extended right hepatic resection in small-for-size settings. Ann Surg 2012;255:405-14. Alvarez FA, Ardiles V, Sanchez Claria R, Pekolj J, de SantibaÁ±es E. Associating liver partition and portal vein ligation for staged hepatectomy (ALPPS): Tips and tricks. J Gastrointest Surg 2013;17:814-21. Knoefel WT, Gabor I, Rehders A, Alexander A, Krausch M, Schulte am Esch J, et al. In situ liver transection with portal vein ligation for rapid growth of the future liver remnant in two-stage liver resection. Br J Surg 2013;100:388-94. Sala S, Ardiles V, Ulla M, Alvarez F, Pekolj J, de SantibaÁ±es E. Our initial experience with ALPPS technique: Encouraging results. Updates Surg 2012;64:167-72. Li J, Girotti P, Königsrainer I, Ladurner R, Königsrainer A, Nadalin S. ALPPS in right trisectionectomy: A safe procedure to avoid postoperative liver failure? J Gastrointest Surg 2013;17:956-61. Dokmak S, Belghiti J. Which limits to the “ALPPS” approach? Ann Surg 2012;256:e6. Zhang GQ, Zhang ZW, Lau WY, Chen XP. Associating liver partition and portal vein ligation for staged hepatectomy (ALPPS): A new strategy to increase resectability in liver surgery. Int J Surg 2014;12:437-41. Yaprak O, Guler N, Altaca G, Dayangac M, Demirbas T, Akyildiz M, et al. Ratio of remnant to total liver volume or remnant to body weight: Which one is more predictive on donor outcomes? HPB 2012;14:476-82. Donati M, Stavrou GA, Oldhafer KJ. Current position of ALPPS in the surgical landscape of CRLM treatment proposals. World J Gastroenterol 2013;19:6548-54. Aloia TA, Vauthey JN. Associating liver partition and portal vein ligation for staged hepatectomy (ALPPS): What is gained and what is lost? Ann Surg 2012;256:e9. Torres OJ, Fernandes Ede S, Oliveira CV, Lima CX, Waechter FL, Moraes-Junior JM, et al. Associating liver partition and portal vein ligation for staged hepatectomy (ALPPS): The Brazilian experience. Arq Bras Cir Dig 2013;26:40-3.
de SantibaÁ±es E, Clavien PA. Playing Play-Doh to prevent postoperative liver failure: The “ALPPS” approach. Ann Surg 2012;255:415-7. Andriani OC. Long-term results with associating liver partition and portal vein ligation for staged hepatectomy (ALPPS). Ann Surg 2012;256:e5. Vennarecci G, Laurenzi A, Santoro R, Colasanti M, Lepiane P, Ettorre GM. The ALPPS procedure: A surgical option for hepatocellular carcinoma with major vascular invasion. World J Surg 2014;38:1498-503. Brustia R, Scatton O, Perdigao F, El-Mouhadi S, Cauchy F, Soubrane O. Vessel identifications tags for open or laparoscopic associating liver partition and portal vein ligation for staged hepatectomy. J Am Coll Surg 2013;217:e51-5. Schadde E, Hernandez-Alejandro R, Lang H, de Santibanes E, Clavien PA. ALPPS offers a better chance of complete resection in patients with primarily unresectable liver tumors. results of a multicentre analysis: Reply. World J Surg 2015;39:1850-1. Shindoh J, Vauthey JN, Zimmitti G, Curley SA, Huang SY, Mahvash A, et al. Analysis of the efficacy of portal vein embolization for patients with extensive liver malignancy and very low future liver remnant volume, including a comparison with the associating liver partition with portal vein ligation for staged hepatectomy approach. J Am Coll Surg 2013;217:126-33. Nasr MM, Hassan AM, Elsebaie SB, Elsebae MA, Nosseir MM. Effect of splenectomy on liver regeneration and function following partial hepatectomy: Experimental study. J Egypt Soc Parasitol 2011;41:601-10. Nagorney DM. Commentary on “can we improve the morbidity and mortality associated with the associating liver partition with portal vein ligation for staged hepatectomy (ALPPS) procedure in the management of colorectal liver metastases?”. Surgery 2015;157:202-3. Schadde E, Ardiles V, Robles-Campos R, Malago M, Machado M, Hernandez-Alejandro R. Early survival and safety of ALPPS:First report of the international ALPPS registry. Ann Surg 2014;260:829-36. Nagakura S, Shirai Y, Wakai T, Nomura T, Hatakeyama K. An 11-year survivor who underwent ten sequential resections of colonic adenocarcinoma metastases. Hepatogastroenterology 2003;50:1032-3. Tanaka K, Matsuo K, Murakami T, Kawaguchi D, Hiroshima Y, Koda K, et al. Associating liver partition and portal veinligation for staged hepatectomy (ALPPS): Short-term outcome, functional changesin the future liver remnant, and tumor growth activity. Eur J Surg Oncol 2015;41:506-12. Schadde E, Schnitzbauer AA, Tschuor C, Raptis DA, Bechstein WO, Clavien PA. Systematic review and meta-analysis of feasibility, safety, and efficacy of a novel procedure: Associating liver partition and portal vein ligation for staged hepatectomy. Ann Surg Oncol 2015;22:3109-20. Jackson T, Siegel KA, Siegel CT. Rescue ALPPS: Intraoperative conversion to ALPPS during synchronous resection of rectal cancer and liver metastasis. Case Rep Surg 2014;2014:487852. Nadalin S, Capobianco I, Li J, Girotti P, Königsrainer I, Königsrainer A. Indications and limits for associating liver partition and portal vein ligationfor staged hepatectomy (ALPPS). Lessons learned from 15 cases at a single centre. Z Gastroenterol 2014;52:35-42. Tanaka K, Shimada H, Matsuo K, Ueda M, Endo I, Togo S. Remnant liver regeneration after two-stage hepatectomy for multiple bilobar colorectal metastases. Eur J Surg Oncol 2007;33:329-35. Tucker ON, Heaton N. The 'small for size' liver syndrome. Curr Opin Crit Care 2005;11:150-5. 1 Conversion therapy and suitable timing for subsequent salvage surgery for initially unresectable hepatocellular carcinoma: What is new?